Lets say while flipping through the Sunday newspaper you land on the real estate section. On that page you notice ads from 20 different mortgage companies. Every single one of them is from small local banks, credit unions, or mortgage brokers. None of which you have ever heard of. Whats interesting about the ads is every single one of them says they can offer lower interest rates in the local area. Mortgage rates are determined every day on the stock market. There are a number of factors that go into it but the main one is the 10 Year Treasury Bond. There is no Local 10 Year Treasury Bond. It’s the same for everybody. Mortgage rates have nothing to do with where your house is located. Whether you are located in Florida or California you are going to be offered the same interest rates on a mortgage. Those small local lenders you saw in the newspaper say they can offer better mortgage rates to people in the local area versus large nationwide lenders as a way to get you call them. Good old fashion Marketing. If they can get you to walk into their office one mile from your house they know its going to be very hard for you to walk out (assuming they can find a loan for you) without saying yes versus hanging up on a phone call. You can’t blame the mortgage broker or bank because they know there is a small percentage of people who feel they are getting a better deal with everything they buy when they buy it close to home. It’s like living near Detroit and saying Ford is going to give you a better deal on a new Ford Fusion than somebody who lives in New Mexico just because you live near Ford’s world headquarters. It does not work that way. Since all lenders, mortgage brokers, and banks get their rates from the same place this let’s us know that “local mortgage rates” is just a marketing strategy. Don’t fall for the local mortgage rates ploy and think you are getting a better mortgage rate. You’re not. All that you are really doing is supporting your local community. If you want to test out my theory call up a national lender Quicken Loans. Get their rates for the day and then immediately call your local mortgage broker or bank. You will see that they are relatively the same. 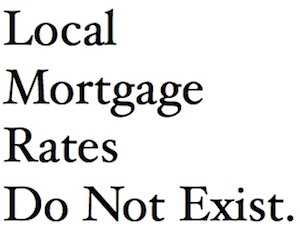 It’s not so much that local mortgage rates do not exist. Yes, you can shop for mortgage rates in your local area with banks, brokers, credit unions, or mortgage lenders that have an office there. But you will not get better rates from local lenders than nationwide lenders.